a film program co-conceived with Alex Clarke. This program is part of a series of shows on « studio practice » spanning from January 12 until April 8, 2017. Blue was originally created for a group show called Parantola (2016) with performances and workshops set in a former Tuberculosis Sanatorium which is still currently being used for rehabilitation purposes, the Paimio Sanitorium, Finland. The video takes its name and format from Derek Jarman’s feature length film Blue (1993) which was released shortly before Jarman’s death from AIDS in the early 90’s. It is also a reference to the song I’m Blue (1999) by the group Eiffel 65. 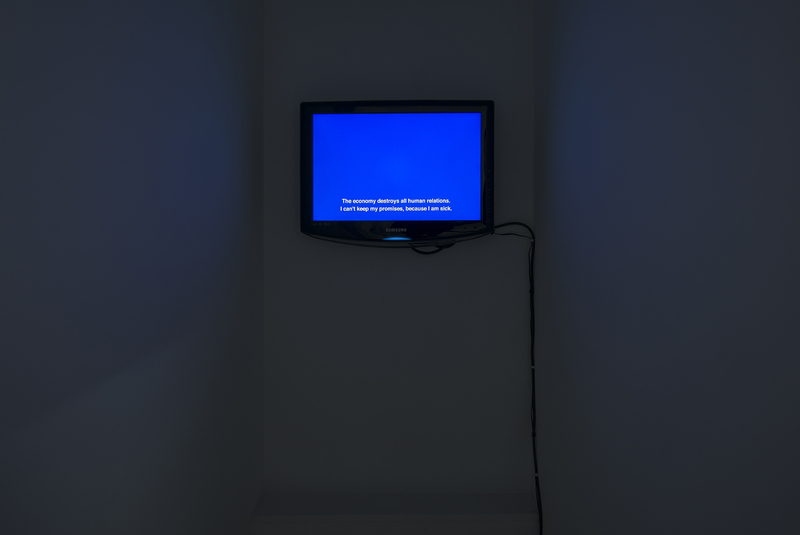 Blue is a kind of meta narrative about the artist himself, trying to complete a video for the Sanatorium show but failing to do so, and then detailing the reasons why, and criticising the idea of the artist as a healer and art as a way of creating ‘wellbeing’. Work in progress was made as part of a suite of works foregrounding the mechanisms of artistic production. 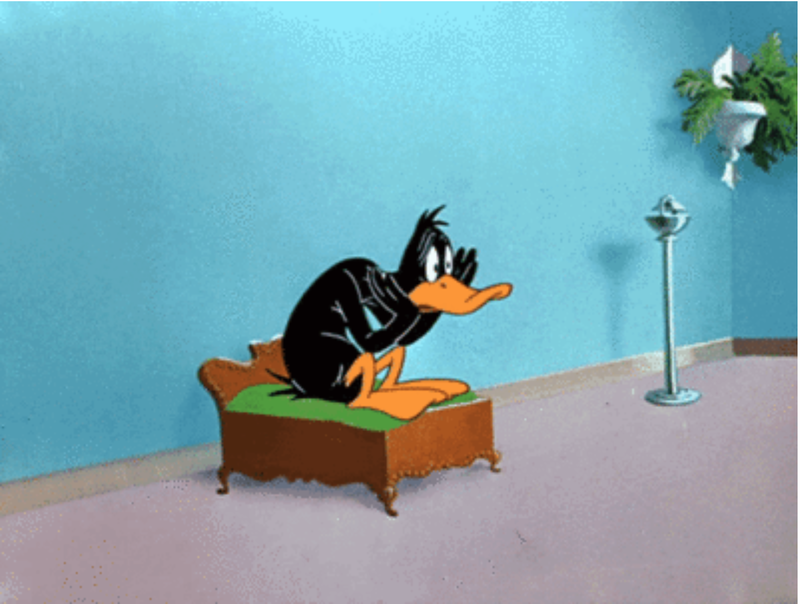 A looped depiction of the cartoon character Daffy Duck, seemingly locked in the throes of ‘writer’s block’, it points with humour to the sincerity and anguish of the creative process. Set inside the Torre de Los Vientos, a outside-inside sculpture by Uruguayan artist Gonzalo Fonseca, Debouts, Salis, Cernés (version Elsa) presents the relationship between a trio – two characters, and the space itself. Equality is always impossible to achieve and the circularity of this trinity suggests that one always tends to dominate the other. 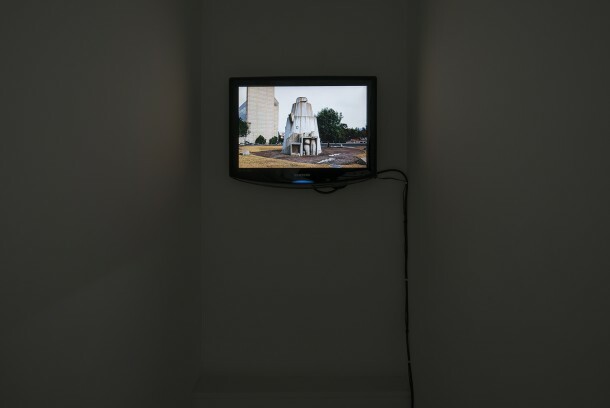 Elsa’s version of the video sets relations between composition and framing, tracing and dirtying, abstraction and narration. However contrasts occur within the sound with its rhythms and ruptures and between the unchangeable stillness of the space and the two persons in constant movement.